Camping for any extended period of time can sometimes be a smelly experience. 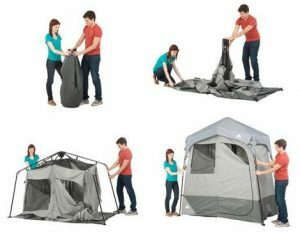 Especially if you’re with a group of people, or even if you’re camping alone or as a couple, on some trips everyone may be a little happier if you utilize a good camping shower tent. Putting together the right portable shower for camping trips is not overly difficult. It only takes a couple of products to create a really comfortable setup. You just need to make sure you get the right ones, because they can make all the difference between enjoying a clean and relaxing camping trip and not looking forward to set up that annoying popup shower that ends up smelling like mildew anyway. We’ve put together this quick guide to portable camping showers with a few of our favorite setups, so you too can easily create a great shower setup for you and your camping mates. If you’ve got the space for it in your campsite, you’d be hard pressed to find a better camping shower tent than the Ozark Trail Instant 2-Room model. It’s 25 square feet (7′ x 3.5′) when assembled, and splits up into a shower room and a changing/utility room using a zip divider in the middle. 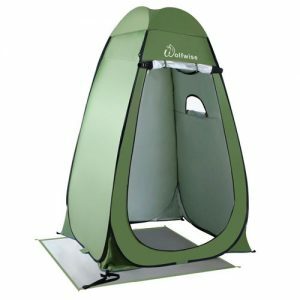 Ozark Trail’s Instant Camping Shower Tent is aptly named, as it pops up with minimal effort, more like an easy-up canopy with pre-attached poles than a traditional tent. Having that separate changing room makes it a lot easier to keep your clothes dry, and depending on the type of camping trip you are on you could even fit a small portable toilet in that room too. There is plenty of privacy with this shower tent, because the walls are actually coated with silver aluminum to keep the light in. As a result, you can’t even see a silhouette outline through this material. 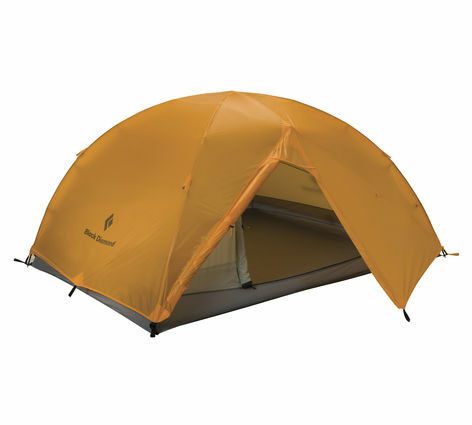 If the shower tent itself wasn’t good enough, this Ozark Trail product also comes with a 5-gallon solar shower bag with a shower head. The solar shower works by filling the bag up with water and then leaving it in the sun (when the bag is hanging in the shower with the canopy roof off, it is exposed to the sun enough there). It heats up quite hot within a couple of hours, so that’s all you need. The only complaint of this shower tent is that the hook that holds the shower bag is just barely strong enough for it. So you aren’t able to easily upgrade to a 10-gallon bag for more water storage. What you could always do though is use a different type of water delivery system, such as a portable propane water tank, on the outside of the tent, and then just feed that hose through a small hole you could make. The drainage of this camping shower tent is always very good and easy. You stand on a waterproof floor that then attaches to the silver aluminum walls through about two inches or so of mesh. Water runs out right through the mesh, while bugs and critters are still unable to enter. 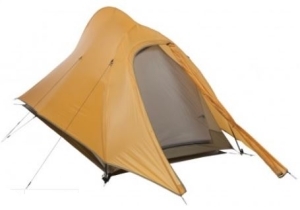 Ozark Trail is not an expensive brand (it’s actually a WalMart brand), and you can get this 2-stall camping shower tent at a very reasonable price that makes it even more worth it. 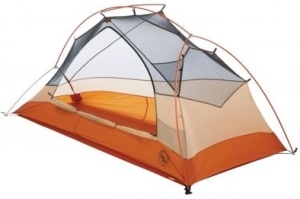 You can check out our Ozark Trail Tents page for more details on various Ozark tents. 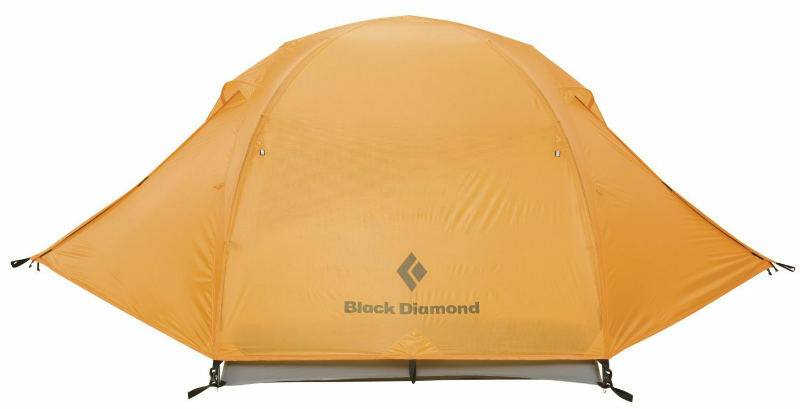 If you’re looking for a simpler shower shelter that is about a third of the cost of the 2-room Ozark tent, going with a pop-up privacy tent can work very well. 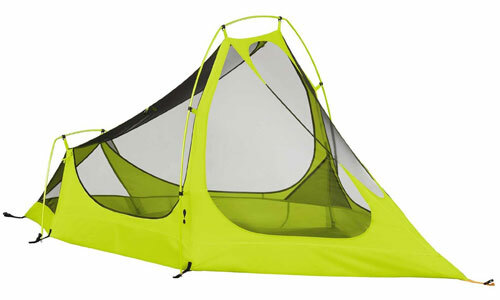 A great option here is the WolfWise Upgrade Instant Pop-Up Privacy Tent. It’s collapsible and doesn’t use any hardware poles, so it literally just pops up with a flick of the wrist. It doesn’t give you as much space as the Ozark, but it does come with several well thought out design features that make it functional. For one, it has mesh vents near the roof for ventilation. It also has a small window for light, a clothesline, and a pouch inside for storing toiletries or your keys. There’s also a separate floor mat (like a small tarp) that can be useful depending on what the ground cover is like where you are camping, as well as a carrying case. This product doesn’t come with an actual outdoor shower, so you’ll want to combine it with something like the below portable camping shower. There are some great battery-powered outdoor shower heads now that are simple to use either with a pop up privacy tent or without. One of the top-rated models today is the Ivation Portable Outdoor Shower. It works very simply. 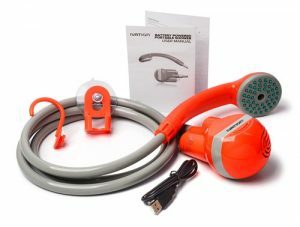 It is a shower head connected via a tube to a battery-powered pump that you drop into a water source, like a bucket of water or a lake. The pump puts the water through a built-in filtration system to keep the water relatively clean before it hits your body, and then pumps it up to the shower head, which you can either hold up yourself or hang up using the little hook shower head holder that also comes with the system. The battery is a rechargeable lithium battery, making it very convenient and not prone to losing much charge capacity over time. It’s strong enough to last for 1 hour of continuous use, and to charge it you simply need a USB charger such as your computer or car-powered USB adapter. The plug to charge it in is behind a little waterproof plug that pops out. 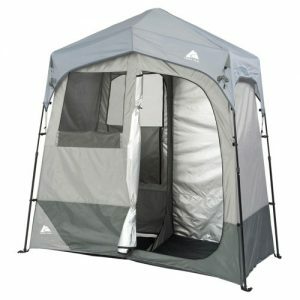 Whether you go with a complete system like the 2-stall Ozark camping shower tent and solar shower, or put together your own little budget shower system with a pop up privacy tent and portable shower, we hope that this guide has been helpful in showing you how easy it can be to achieve a good deal of cleanliness and comfort on your next camping trip!